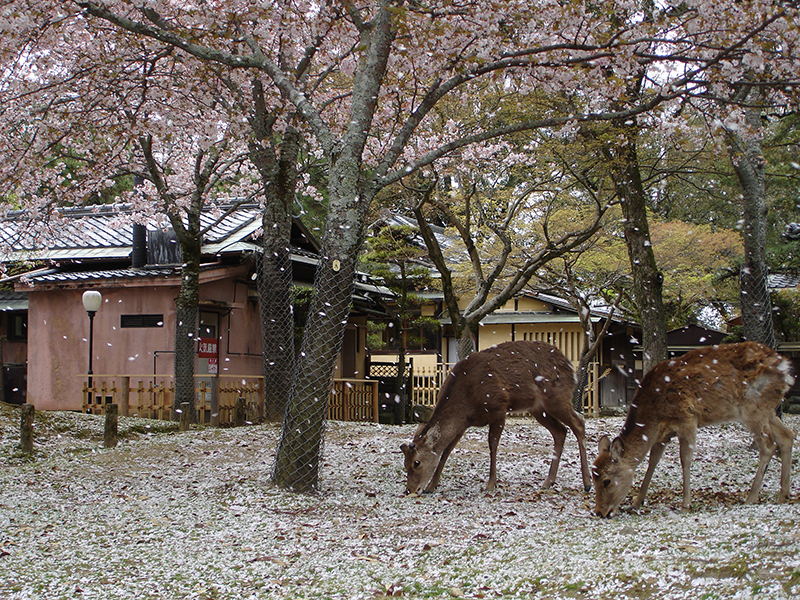 The city of Nara (奈良) is the head of the Nara Prefecture, in the Kansai region of the Honshu Island of Japan. Born as the Capital of Japan, it acted as such for only 84 years, and today it offers a beautiful collection of historical Buddhist temples and Shinto shrines. As mentioned in the introduction, Nara acted as the capital of Japan from 710 to 794 AD, a period referred to as the Nara period. 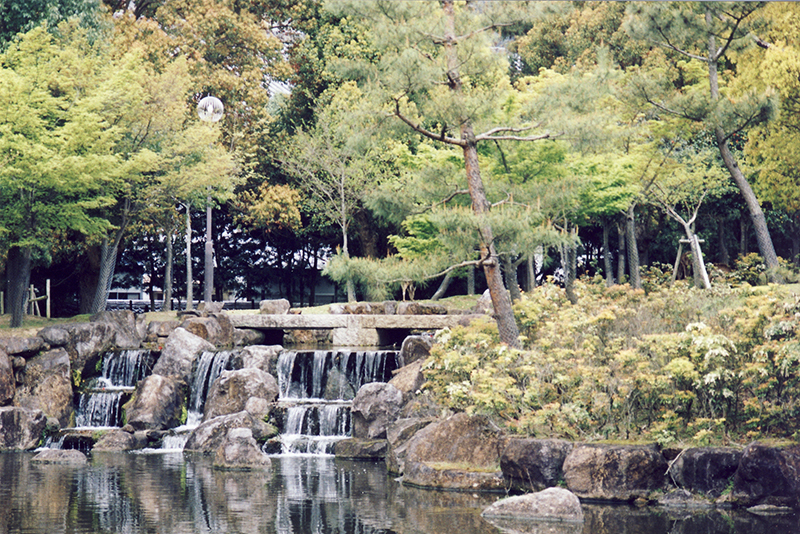 Established by the Empress Gemmei (言明皇后 Genmei-kogo), the Nara period is characterized by the increasing power of the Buddhist clergy over the government, so much so that Emperor Kammu moved the capital to modern day Kyoto (formerly Heian-kyo) to distance himself from the influence of the clergy. The Nara period served as cradle to the classic Japanese literature, as the Kojiki, the Nishon Shoki and the Man-yoshu were all written during this century. Today, Nara is the seat of the prefectural government and though not extremely populated, the city counts about 380,000 inhabitants, it is almost a mandatory visit for tourists, with its beautiful temples and its calm, relaxing atmosphere. The city borders with Kyoto on the north and Osaka on the west, and being well connected, it is perfect for a day trip for anyone visiting one of these two cities. Nara has a high density of landmarks to visit. The city houses many Buddhist temples, Shinto shrines and the Heijo Palace, the former imperial palace built when Nara was the capital of Japan. The Nanto Shichi Daiji (南都七大寺) or the Seven Great Temples of Nanto (a synonym of Nara) refer to seven powerful Buddhist temples located in the city (though one is off the border of modern Nara), they are: the Daian-ji, Gango-ji, Horyu-ji, Kofuku-ji, Saidai-ji, Todai-ji, and the Yakushi-ji. 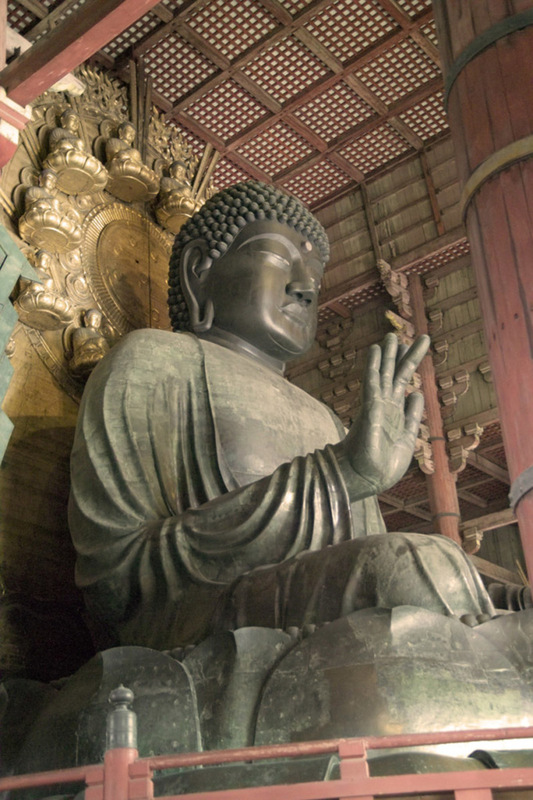 The most famous of these temples is probably the Todai-ji (東大寺), as it houses the world’s largest bronze statue of the Buddha Vairocana and also serves as the headquarter of the Kegon school of Buddhism. The entrance to the Todai-ji is guarded by two colossal status of Bishamonten and Komokuten. The Todai-ji is one of the “Historic Monuments of Ancient Nara”, a UNESCO World Heritage Site, that includes seven other locations in Nara. The other monuments of this site are: the Buddhist temples Kofuku-ji, Gango-ji, Yasukushi-ji, and Toshodai-ji; the Kasuga shrine, the Heijo Palace and the Kasugayama Primeval Forest. Another world famous attraction in the city is the Nara Park (奈良公園 Nara Koen), located at the foot of Mount Wakakusa, this park houses many of the historical attractions of the city (such as the Todai-ji and the Kasuga shrine) and is well known for the sika deers that freely roam the park, that have learned to live quite well with humans, as people are free to feed them food that can be bought there. The deers are also extremely educated, as they will bow to you, if you bow to them. Nara has many yearly events that you won’t want to miss if you are around. One of the most important events in Nara is the Yamayaki or Grass Burning Festival, held on the fourth Saturday of January. 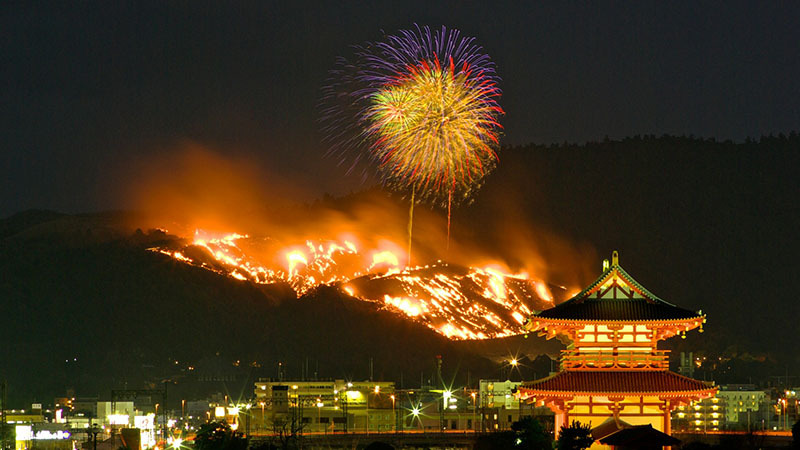 For the Yamayaki, a fire is lit on the Wakakusa-yama, the mountain over Nara. The event includes a firework show. Another event to see is the Mantorno Lantern Festival, held twice a year, in February and August. 3000 lanterns light the way to the Kasuga-Taisha Shrine, and it is safe to say this is a magical event to witness that you just can’t miss if you are in Japan during this period. Other events in Nara are the Omizutori in March, the Takigi Noh in May, the Uneme Matsuri in September and the On Matsuri in in December. Nara is overall, an enchanting city, and you could just get lost in its park, wondering from temple to temple, all the while playing with the gentle deers the roam free in its green areas. It is a great destination for a one day field trip.